Objective: To clarify the clinical usefulness of preoperative fibre-tracking in affected pyramidal tracts for intraoperative monitoring during the removal of brain tumours from patients with motor weakness. Methods: We operated on 10 patients with mild to moderate motor weakness caused by brain tumours located near the pyramidal tracts under local anaesthesia. Before surgery, we performed fibre-tracking imaging of the pyramidal tracts and then transferred this information to the neuronavigation system. During removal of the tumour, motor function was evaluated with motor evoked potentials elicited by cortical/subcortical electrical stimulation and with voluntary movement. Results: In eight patients, the locations of the pyramidal tracts were estimated preoperatively by fibre-tracking; motor evoked potentials were elicited on the motor cortex and subcortex close to the predicted pyramidal tracts. In the remaining two patients, in which fibre-tracking of the pyramidal tracts revealed their disruption surrounding the tumour, cortical/subcortical electrical stimulation did not elicit responses clinically sufficient to monitor motor function. In all cases, voluntary movement with mild to moderate motor weakness was extensively evaluated during surgery and was successfully preserved postoperatively with appropriate tumour resection. Conclusions: Preoperative fibre-tracking could predict the clinical usefulness of intraoperative electrical stimulation of the motor cortex and subcortical fibres (ie, pyramidal tracts) to preserve affected motor function during removal of brain tumours. In patients for whom fibre-tracking failed preoperatively, awake surgery is more appropriate to evaluate and preserve moderately impaired muscle strength. A number of anatomo-functional evaluations of the pyramidal tracts have been developed to help preserve motor function while maximising the removal of brain tumours located in close proximity to the pyramidal tracts. 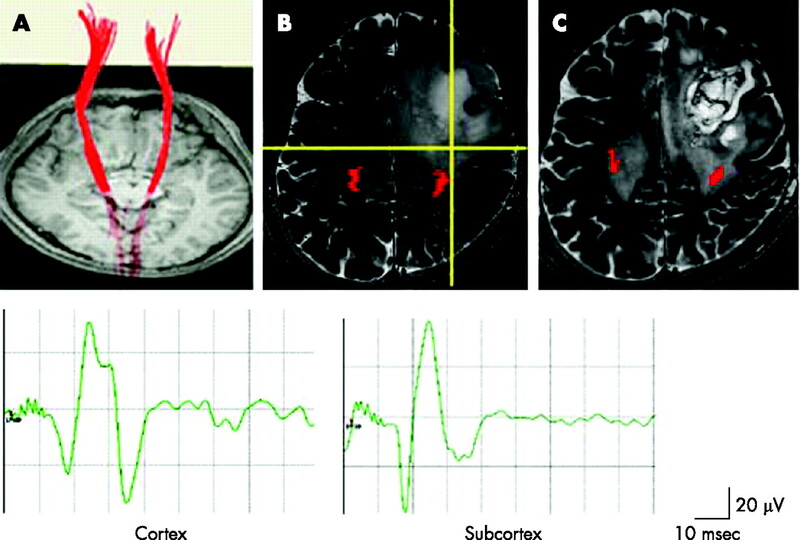 Integrated functional neuronavigation and preoperative neuroimaging, such as functional MRI (fMRI), magnetoencephalography (MEG) and fibre-tracking, have been combined with intraoperative electrical stimulation to establish the clinical significance of the findings of each evaluation method.1–6 Despite these developments in mapping and monitoring techniques, little is known about their clinical utility for patients suffering from motor weakness caused by brain tumours. As the tolerance of affected pyramidal tracts for surgical manipulation is weaker in comparison with that in patients without motor weakness, intraoperative evaluation plays a critical role in the surgeon’s ability to maintain motor function. Decreased motor function itself, however, may affect the accuracy of intraoperative evaluation. White matter fibre-tracking using diffusion tensor imaging is capable of visualising the integrity of white matter.1,4,7,8,9,10,11 Although fibre-tracking of the pyramidal tracts does not always correlate with the degree of motor weakness, it does reflect the functional condition of the fibres.16 To predict the clinical usefulness of intraoperative evaluation by presurgical non-invasive fibre-tracking imaging in patients with motor weakness, we compared the results of pyramidal tract fibre-tracking with the results of intraoperative direct electrical stimulation of the motor cortex and subcortical fibres (ie, pyramidal tracts) and spontaneous movements. We examined 10 patients, aged 28–67 years, who suffered from mild to moderate preoperative motor weakness due to brain tumours located close to the pyramidal tracts (table 1). The tumours included five cases of glioblastoma multiforme, three of anaplastic astrocytoma, one of diffuse astrocytoma and one cavernoma. All lesions were located within the language dominant frontal lobe; before operation, five patients had mild motor aphasia. In response to stimulation of the bilateral median and tibial nerves, scalp somatosensory evoked potentials (SEPs) were recorded in all patients. To evaluate cortical activity during voluntary movement, we evaluated finger/foot tapping during fMRI and MEG studies. To convert tractography into a DICOM format dataset, three processing steps were applied. The first step was to change tractography to a voxel dataset. An 8 bit voxel dataset with binary contrast was created from the original tractography using DtiStudio, with the same matrix size as b = 0 images. In this voxelised tractography, marked voxels where fibre-tracts penetrate displayed the largest value, and other voxels the smallest ones.15 The second step was to create merged images of tractography and b = 0 images with the same matrix size as the MPRAGE images. The 3-orthogonal coordinates of each voxel in MPRAGE and b = 0 images were obtained from the DICOM header information. Trilinear interpolation was applied for voxel value calculation. Merged images were generated from interpolated tractography and interpolated b = 0 images. The third step was to convert merged images into DICOM format, according to the MPRAGE header information. DICOM format tractography with the same imaging matrices as MPRAGE were obtained. The MPRAGE images, fast imaging with steady precession images and DICOM format tractography images were transferred to the navigation system (StealthStation TRIA plus, Medtronic Sofamor-Danek, Memphis, Tennessee, USA; or Vector Vision Compact Navigation System, Brain LAB AG Heimstetten, Germany) using Cranial 4.0/VV Cranial 7.5 software. We then applied non-rigid image fusion based on a mutual information algorithm using ImMerge/iPlan2.5 software. The day before the operation, we performed axial whole brain CT with a contiguous slice thickness of 1 mm and six independent scalp point markers for anatomical registration. The CT dataset was also input into the navigation system. CT, MPRAGE and DICOM format tractography were automatically registered; the anatomical registration points were verified to minimise navigation errors. As the differences in distortion between DTI and MPRAGE were within a few millimetres according to a phantom for the neuronavigation system, we determined that the spatial accuracy of the single shot echo planar sequence would be reliable; the potential error of the navigation due to image distortions would be limited to a few millimetres. At navigation setup, the accuracy of image registration was less than 2 mm. Fibre-tracking tractography of the pyramidal tracts between the cerebral peduncle and the precentral gyrus was successful in 50 surgically treated brain tumour patients without motor weakness (data not shown). The bilateral abductor pollicis brevis, biceps brachialis, deltoid, gastrocnemius, quadriceps femoris and tibialis anterior muscles were chosen for electromyogram recording using neurological monitoring (Epoch XP, Axon Systems, New York, USA). After induction, general anaesthesia was maintained by intravenous infusion with propofol for craniotomy. Muscle relaxants were administered only for intubation and were not continued during surgery. The highest N20–P20 phase reversal of cortical SEPs was recorded using 4×5 subdural electrodes to identify the central sulcus. If SEPs were not sufficient to define the central sulcus, intraoperative visual inspection of the sulci combined with neuronavigation was used to orient the anatomy. After discontinuing the propofol infusion, patients awoke without further deficits. To monitor motor function of the corticospinal tracts electrophysiologically, we first stimulated the precentral gyrus to identify a positive control motor evoked potential (MEP) and the intensity appropriate to stimulate subcortical fibres. The intensity of cortical stimulation was increased from 5 mA to a maximum of 25 mA. If afterdischarges were induced, we repeated the test at the same intensity or using a 1 mA lower current. During removal of tumour tissue within 2 cm of the pyramidal tracts by intraoperative neuronavigation, we performed repetitive subcortical electrical stimulations. Electrical stimuli were applied across a relatively wide area to avoid any anatomical shift caused by the tumour. Five trains of monophasic square waves with a duration of 0.2 ms were applied. Current was delivered by a pair of adjacent electrodes (3 mm in diameter) with a centre-to-centre inter-electrode distance of 1 cm.3 A 50 Hz electric current was delivered for language and sensory testing. Language functions were assessed by the reading of a paragraph, spontaneous speech, naming and comprehension activities.17 We confirmed the points of stimulation by visualisation using the navigation system. In all patients, the minimum distances between points of stimulation and the fibre-tracking pyramidal tracts were measured using three dimensional MRI by intraoperative neuronavigation. Results of evaluation of motor function by preoperative and intraoperative assessments are summarised in table 2. Preoperative fibre-tracking identified the pyramidal tracts of eight patients, including seven with mild hand motor weakness (patient Nos 4–10) and one with moderate motor weakness (3/5) of his upper limb (patient No 3) (figs 1, 2). In all patients, MEPs were elicited for all of the muscles evaluated, including the weakened muscles, by electrical stimulation of both the precentral gyrus and the subcortex within 1 cm of the pyramidal tracts, identified by intraoperative functional neuronavigation. The tumours were removed while confirming stable MEP responses by repetitive electrical stimulation. Motor function was either maintained or improved both during and after the operation. In addition, we demonstrated preservation of the pyramidal tracts by postoperative fibre-tracking (patient Nos 3, 4, 6 and 9). Upper: preoperative T2 weighted MRI in patient Nos 3, 5, 6, 7, 8, 9 and 10, with brain tumours showing a hyperintense area that is close to the pyramidal tracts (red), identified by fibre-tracking. Lower: postoperative T2 weighted MRI demonstrated the extent of tumour removal. Postoperative fibre-tracking in patient Nos 3, 6 and 9 revealed preservation of the pyramidal tracts (red). Patient No 4 had a left fronto-parietal glioblastoma multiforme. (A) Preoperative fibre-tracking identified symmetrical pyramidal tracts (red lines) from the cortex to the cerebral peduncles. (B) Brain T2 weighted MRI revealed a hyperintense area in close proximity to the left pyramidal tract, identified by fibre-tracking (red). Cortical stimulation of the left precentral gyrus, which had been defined by a somatosensory evoked potential, elicited a motor evoked potential (MEP) in the right abductor pollicis brevis muscle (Cortex). During removal of the tumour, subcortical stimulation elicited MEPs at the bottom of the tumour (intersection of the yellow lines in the intraoperative navigation image), 1 cm from the edge of the predicted pyramidal tract (red) (Subcortex). To avoid causing additional neurological deficits, no further removal was performed. (C) Postoperative T2 weighted MRI demonstrated preservation of the pyramidal tracts identified by fibre-tracking (red). In two patients (patient Nos 1 and 2), fibre-tracking of the pyramidal tracts around the tumour failed. Patient No 1 (fig 3) suffered from preoperative right hemiparesis (3/5 on the brachium, 4/5 on the hand and 2/5 on the leg) because of left fronto-parietal glioblastoma multiforme. Cortical SEPs exhibited weak responses on stimulation of the right median nerve; no response was observed after stimulation of the right tibial and sural nerves. Cortical stimulation of the anatomically confirmed precentral gyrus by neuronavigation elicited a rare MEP in his abductor pollicis brevis muscle; no MEPs were elicited in his biceps brachialis, deltoid, gastrocnemius, quadriceps femoris or tibialis anterior muscles. Neurological examinations soon after the patient recovered from general anaesthesia demonstrated no additional deficits. As the tumour was removed piece by piece, continuous evaluation of muscle strength helped preserve motor function of the lower extremities and improve motor function of the upper extremities to 4/5. Subcortical electrical stimulation did not elicit MEPs at any point during resection of the tumour. Patient No 2 (fig 4) exhibited right hemiparesis (1/5 on the upper extremity and 4/5 on the leg) preoperatively, caused by a left fronto-insulo-temporo-parietal glioblastoma multiforme. We operated on this patient with the goal of preserving motor function of the lower extremities. She also displayed mild motor aphasia. Cortical SEPs could not be elicited. Despite the absence of MEP responses following cortical stimulation of the wide area surrounding the anatomically identified precentral gyrus by neuronavigation, subcortical stimulation elicited MEPs of her lower but not upper extremities. Through continuous evaluation of muscle strength intraoperatively, motor function of the lower extremities was preserved during removal of the tumour. Postoperatively, she exhibited adequate removal of the tumour without any further neurological deficits. Patient No 1. Fibre-tracking of the pyramidal tracts was disrupted in a 67-year-old man with a left fronto-parietal glioblastoma multiforme. Upper: preoperative T2 weighted MRI identified a focus of hyperintensity in the left perirolandic region with gadolinium enhancement of the rostral precentral cortex. Stimulation of the left cortex rarely elicited weak motor evoked potential (MEP) responses on the right abductor pollicis brevis muscle. Subcortical stimuli, even on the approximated posterior bank of the precentral gyrus on neuronavigation (intersection of the yellow lines in the intraoperative navigation image), did not elicit MEPs. Middle: a relative anisotropy map indicated the principal eigenvector (green, anterior–posterior; red, right–left; and blue, inferior–superior). Fibre-tracking of the left pyramidal tracts (red lines) near the tumour was disrupted during its course to the cortex. Lower: postoperative MRI with gadolinium enhancement. Patient No 2. Left: fibre-tracking of the pyramidal tracts (red lines) demonstrated disruption around a left fronto-insulo-temporo-parietal glioblastoma multiforme. Middle: during removal of the tumour, cortical stimuli did not elicit any motor evoked potentials (MEPs). Subcortical stimuli very close to the predicted pyramidal tracts (red) on neuronavigation (intersection of the yellow lines in an intraoperative navigation image), however, elicited MEPs of her affected right lower extremities, but not her right upper extremities. Right: Postoperative T2 weighted MRI demonstrated that the pyramidal tracts identified by fibre-tracking (red) were preserved. To maintain the quality of life of patients with motor weakness undergoing surgical treatment of brain tumours, it is essential to evaluate motor function intraoperatively. The damage done to the pyramidal tracts, however, may affect the results of the evaluation. As MEPs elicited by direct intraoperative electrical stimulation remain the most reliable index of motor function,21–23 it is important to predict if MEP responses will be elicited from the affected motor cortex and the pyramidal tracts during removal of the tumour. Presurgical evaluations, such as the degree of motor weakness (muscle strength), MEG, fMRI, positron emission tomography, transcranial magnetic stimulation and fibre-tracking are all potential candidates for predicting intraoperative MEP responses. In this study, the degree of preoperative motor weakness did not always correlate with the incidence of intraoperative MEP responses. Muscles that were moderately affected by compression caused by the tumour elicited MEPs following cortical/subcortical stimulation (patient No 3), a result that is consistent with previous case reports.2,24 MEP responses, however, could not be elicited from only mildly affected muscles in two patients (patient Nos 1 and 2). MEG, fMRI and positron emission tomography images provide information concerning motor function at the cortical, but not subcortical, level. Repetitive voluntary movements are often necessary to elicit motor evoked fields by MEG and bold effects by fMRI. While preoperative scalp SEPs correlated with the incidence of MEP responses in our patients, the results of SEP assessments do not directly reflect motor function. Fibre-tracking of the affected pyramidal tracts was first compared with the incidence of intraoperative MEP responses by direct cortical/subcortical electrical stimulation. Subcortical MEPs were always elicited in regions in close proximity to the pyramidal tracts that had been predicted by fibre-tracking in patients with mild to moderate preoperative motor weakness. In addition, continuous fibre-tracking of the pyramidal tracts from the motor cortex to the cerebral peduncle indicated the positive response of cortical MEPs. On the other hand, cortical MEPs were never elicited as reliable responses in patients with disrupted fibre-tracking pyramidal tracts. These data suggest that preoperative fibre-tracking of the pyramidal tracts provides anatomical information as well as functional information in predicting the clinical usefulness of intraoperative cortical/subcortical electrical stimulation. Several limitations to fibre-tracking as a preoperative evaluation, however, should be mentioned. Selection of the seed ROIs and the thresholding of fractional anisotropy, which define the parameter of the algorithm used in the procedure, may subjectively affect the errors in track trajectories.8,25,26 In the present study, individual muscle maintained various degrees of motor activity preoperatively instead of disruption on the fibre-tracking pyramidal tracts, which may reflect the limitations of fibre-tracking from technical errors and pathological conditions. Part of the pyramidal fibres tracking from the precentral gyrus in lower convexity may fail to trace the precise course because the pyramidal tract intersects with callosal fibres and the superior longitudinal fasciculus at the level of the centrum semiovale.3,27,28 Lack of visualisation of some upper limb fibres would account for some of the discrepancies between extent of weakness and ability to visualise fibres. To compare the pyramidal fibres tracking and MEP responses more precisely, taking intraoperative brain shift29 into consideration, DTI image processing during the course of surgery with the use of intraoperative MRI is needed.5,30,31 In addition, individual pathophysiological factors resulting from the brain tumours may affect the results of fibre-tracking,2,10,20,32,33 although it is controversial whether the tumour itself or peritumoral oedema on the pyramidal tracts can be distinguished by DTI metrics.34,35 In the two such patients evaluated in this study, preservation of motor function indicated that secondary effects, such as oedema or mass effect, rather than tumour infiltration, caused the motor deficits. Relatively large amounts of peritumoral oedema in these patients compared with the other eight patients might cause unsuccessful fibre-tracking of the pyramidal tracts. Although a wide area was stimulated electrically, a portion of the pyramidal tracts may have been shifted by compression of the tumour. Further studies with a larger number of patients will be necessary to study the physiological significance of fibre-tracking of affected pyramidal tracts and to clarify the clinical relationship between preoperative fibre-tracking and intraoperative cortical/subcortical electrical stimulation. The tendency for patients not to be operated on until they begin to suffer from moderate motor weakness due to growing brain tumours may, however, limit these studies. In addition, postoperative fibre-tracking of the pyramidal tracts and neurological status should be compared with the extent of tumour resection for further verification of the clinical value of preoperative fibre-tracking. Coenen V A, Krings T, Axer H, et al. Intraoperative three-dimensional visualization of the pyramidal tract in a neuronavigation system (PTV) reliably predicts true position of principal motor pathways. Surg Neurol 2003;60:381–90. Kamada K, Todo T, Masutani Y, et al. Combined use of tractography-integrated functional neuronavigation and direct fiber stimulation. J Neurosurg 2005;102:664–72. Mikuni N, Oakada T, Nishida N, et al. Comparison between motor evoked potential and fiber tracking for estimating pyramidal tracts near brain tumors. J Neurosurg 2007;106:128–33. Nimsky C, Ganslandt O, Fahlbusch R. Implementation of fiber tract navigation. Neurosurgery2006;58:292–304. Nimsky C, Ganslandt O, Buchfelder M, et al. Intraoperative visualization for resection of gliomas: the role of functional neuronavigation and intraoperative 1.5 T MRI. Neurol Res 2006;28:482–7. Okada T, Mikuni N, Miki. et al Corticospinal tract localization: integration of diffusion-tensor tractography at 3-T MR imaging with intraoperative white matter stimulation mapping—preliminary results. Radiology 2006;240:849–57. Hendler T, Pianka P, Sigal M, et al. Delineating gray and white matter involvement in brain lesions: three-dimensional alignment of functional magnetic resonance and diffusion-tensor imaging. J Neurosurg 2003;99:1018–27. Mori S, Crain B J, Chacko V P, et al. Three-dimensional tracking of axonal projections in the brain by magnetic resonance imaging. Ann Neurol 1999;45:265–9. Wakana S, Jiang H, Nagae-Poetscher L M, et al. Fiber tract-based atlas of human white matter anatomy. Radiology 2004;230:77–87. Witwer B P, Moftakhar R, Hasan K M, et al. Diffusion-tensor imaging of white matter tracts in patients with cerebral neoplasm. J Neurosurg 2002;97:568–75. Yagishita A, Nakano I, Oda M, et al. Location of the corticospinal tract in the internal capsule at MR imaging. Radiology 1994;191:455–60. Lee J S, Han M K, Kim S H, et al. Fiber tracking by diffusion tensor imaging in corticospinal tract stroke: Topographical correlation with clinical symptoms. Neuroimage 2005;26:771–6. Okada T, Miki Y, Fushimi Y, et al. 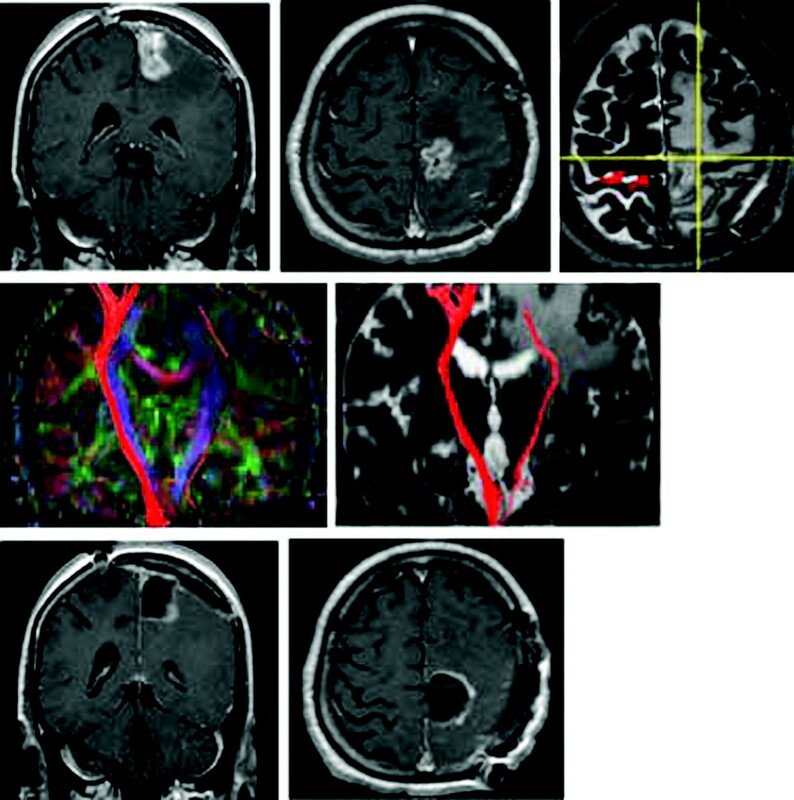 Diffusion-tensor fiber tractography: intraindividual comparison of 3.0-T and 1.5-T MR imaging. Radiology 2006;238:668–78. Jiang H, van Zijl P C, Kim J, et al. DtiStudio: resource program for diffusion tensor computation and fiber bundle tracking. Comput Methods Programs Biomed 2006;81:106–16. Naganawa S, Koshikawa T, Kawai H, et al. Optimization of diffusion-tensor MR imaging data acquisition parameters for brain fiber tracking using parallel imaging at 3 T. Eur Radiol 2004;14:234–8. Yamada K, Kizu O, Mori S, et al. Brain fiber tracking with clinically feasible diffusion-tensor MR imaging: initial experience. Radiology 2003;227:295–301. Mikuni N, Ohara S, Ikeda A, et al. Evidence for a wide distribution of negative motor areas in the perirolandic cortex. Clin Neurophysiol 2006;117:33–40. Dejong R N. Case taking and the neurological examination. In: Barker AB, ed. Clinical neurology. New York: Hoeber-Harper, 1955:1–100. Keles G E, Lundin D A, Lamborn K R, et al. Intraoperative subcortical stimulation mapping for hemispherical perirolandic gliomas located within or adjacent to the descending motor pathways: evaluation of morbidity and assessment of functional outcome in 294 patients. J Neurosurg 2004;100:369–75. Kinoshita M, Yamada K, Hashimoto N, et al. Fiber-tracking does not accurately estimate size of fiber bundle in pathological condition: initial neurosurgical experience using neuronavigation and subcortical white matter stimulation. Neuroimage 2005;25:424–9. Duffau H. Lessons from brain mapping in surgery for low-grade glioma: insights into associations between tumour and brain plasticity. Lancet Neurol2005;4:476–86. Kombos T, Suess O, Ciklatekerlio O, et al. Monitoring of intraoperative motor evoked potentials to increase the safety of surgery in and around the motor cortex. J Neurosurg 2001;95:608–14. Neuloh G, Pechstein U, Cedzich C, et al. Motor evoked potential monitoring with supratentorial surgery. Neurosurgery 2004;54:1061–72. Duffau H. Recovery from complete hemiplegia following resection of a retrocentral metastasis: the prognostic value of intraoperative cortical stimulation. J Neurosurg2001;95:1050–2. Clark C A, Barrick T R, Murphy M M, et al. White matter fiber tracking in patients with space-occupying lesions of the brain: a new technique for neurosurgical planning? Neuroimage 2003;20:1601–8. Lin C P, Tseng W Y, Cheng H C, et al. Validation of diffusion tensor magnetic resonance axonal fiber imaging with registered manganese-enhanced optic tracts. Neuroimage 2001;14:1035–47. Berman J I, Berger M S, Mukherjee P, et al. Diffusion-tensor imaging-guided tracking of fibers of the pyramidal tract combined with intraoperative cortical stimulation mapping in patients with gliomas. J Neurosurg 2004;101:66–72. Wiegell M R, Larsson H B, Wedeen V J. Fiber crossing in human brain depicted with diffusion tensor MR imaging. Radiology2000;217:897–903. Reinges M H, Nguyen H H, Krings T, et al. Course of brain shift during microsurgical resection of supratentorial cerebral lesions: limits of conventional neuronavigation. Acta Neurochir (Wien) 2004;146:369–77. Nimsky C, Ganslandt O, Hastreiter P, et al. Intraoperative diffusion-tensor MR imaging: shifting of white matter tracts during neurosurgical procedures—initial experience. Radiology 2005;234:218–25. Nimsky C, Ganslandt O, Hastreiter P, et al. Preoperative and intraoperative diffusion tensor imaging-based fiber tracking in glioma surgery. Neurosurgery 2005;56:130–8. Beppu T, Inoue T, Kuzu Y, et al. Utility of three-dimensional anisotropy contrast magnetic resonance axonography for determining condition of the pyramidal tract in glioblastoma patients with hemiparesis. J Neurooncol 2005;73:137–44. Laundre B J, Jellison B J, Badie B, et al. Diffusion tensor imaging of the corticospinal tract before and after mass resection as correlated with clinical motor findings: preliminary data. AJNR Am J Neuroradiol 2005;26:791–6. Lu S, Ahn D, Johnson G, et al. Diffusion-tensor MR imaging of intracranial neoplasia and associated peritumoral edema: introduction of the tumor infiltration index. Radiology 2004;232:221–8. Provenzale J M, McGraw P, Mhatre P, et al. Peritumoral brain regions in gliomas and meningiomas: investigation with isotropic diffusion-weighted MR imaging and diffusion-tensor MR imaging. Radiology 2000;232:451–60. Mikuni N, Ikeda A, Yoneko H, et al. Surgical resection of an epileptogenic cortical dysplasia in the deep foot sensorimotor area: a case report. Epilepsy Behav 2005;7:559–62. Duffau H, Lopes M, Denvil D, et al. Delayed onset of the supplementary motor area syndrome after surgical resection of the mesial frontal lobe: a time course study using intraoperative mapping in an awake patient. Stereotact Funct Neurosurg 2001;76:74–82.